Men’s rooms were not created for entertainment, but some members of the species have demonstrated over the decades — and probably the centuries — that they think otherwise. One of the most memorable instances occurs in The Catcher in the Rye, where seeing the F-word on the wall of a museum men’s room sends Holden Caulfield into an epic rant. Truth is, Caulfield was a neurotic, sexually frustrated 16-year-old; a lot of things set him off. If he were a neurotic, sexually frustrated 16-year-old in today’s world, social media trolls would probably make him homicidal. But fictional character though he may be, Caulfield’s dismay is well taken. Other than the prim reminder that “Employees must wash hands,” the writing on men’s room walls tends to be crude, insulting and banal. It’s a Darwinian reminder that the species is still evolving, and that many of those who have been de-selected have not yet dropped by the wayside. Eventually, the graffiti will be painted over, unlike the cave drawings in France, which were the work of actual primitives as opposed to primitive thinkers. On rare occasions, though, higher intelligence visits the men’s room. In a bar several years ago, the men’s room wall had the front page of the day’s sports section framed and hanging above the urinal. We’re not talking about the The New Yorker here, but it was a thoughtful intervention between man and his lesser self. The obvious question is, what’s on the wall now that no one reads newspapers? A message like that makes a guy want to do his part. Cleaning men’s room has got to be a thankless job, and anybody who approaches it with humor deserves the best marksmanship a guy can muster. But what I saw on the wall of the men’s room at Get Scene Studios in Atlanta recently raises men’s room graffiti to entertainment if not art itself. Get Scene is an acting studio, and the creatives in the building obviously take their work — and their hygiene — seriously. 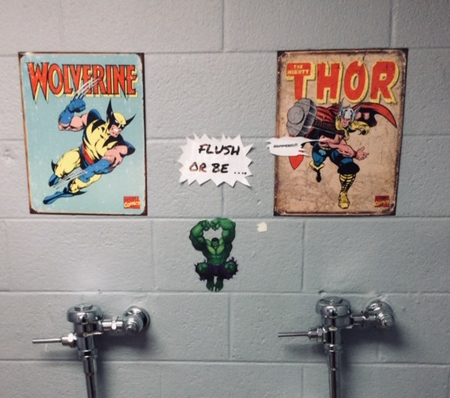 Hanging above the urinals were posters of Wolverine and Thor. Below and between them was a cut-out of the Hulk. All three superheroes were in action. Wolverine is charging full-tilt and brandishing a menacing fist. Hulk, in mid-air with his legs pulled up beneath him, is poised to deliver a devastating double-fisted blow. Thor, left foot planted and his cape flying, has already hurled his hammer — directly at the viewer. But this wasn’t just idle Superhero fan worship. They were up there for a reason. It would be nice to think that the next time I visit a men’s room, I might find something similarly inspired, but I’m not getting my hopes up. This entry was posted in Uncategorized and tagged cave drawings, Darwinian, F-word, Get Scene Studios, graffiti, Holden Caulfield, Hulk, men's rooms, newspapers, sports section, Superheroes, The Catcher in the Rye, The New Horker, Thor, Wolverine on November 12, 2018 by John Christensen.